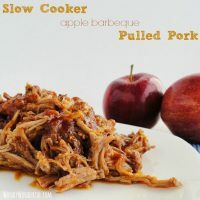 I can honestly say that this Slow Cooker Apple Barbeque Pulled Pork is one of the most satisfying meals that I have eaten lately. And I eat a lot of good food! I don’t eat much meat and I almost never use my slow cooker. But I have been craving a bbq pulled pork sandwich so bad! 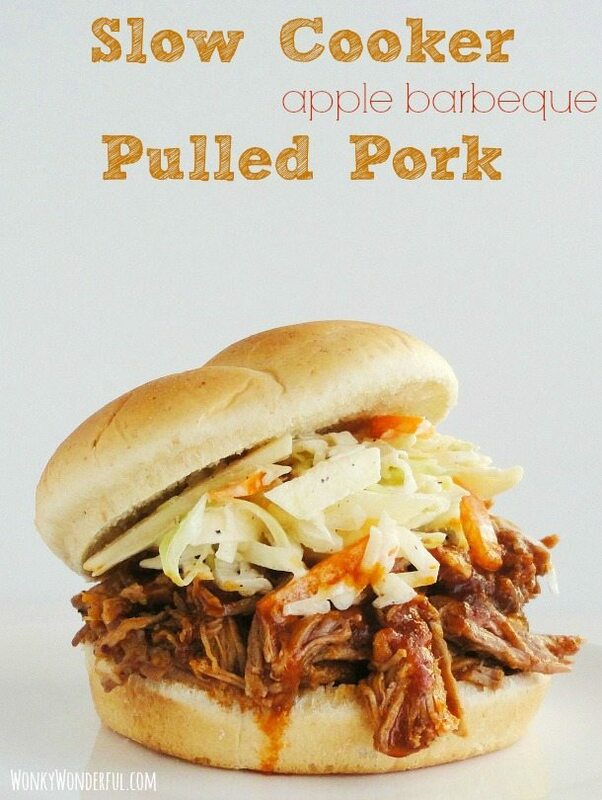 Everywhere I turn I have been seeing mouthwatering pulled pork sandwiches dripping with barbeque sauce. On food blogs, on Pinterest, on cooking shows, on the cover of Food Network Magazine . . . Alright already! I am no longer tormented by my craving. I joined the bbq pulled pork invasion and made my own sandwich that is overloaded with fall-off the bone pork then smothered with sweet and tangy barbeque sauce and topped with cool, crisp slaw! 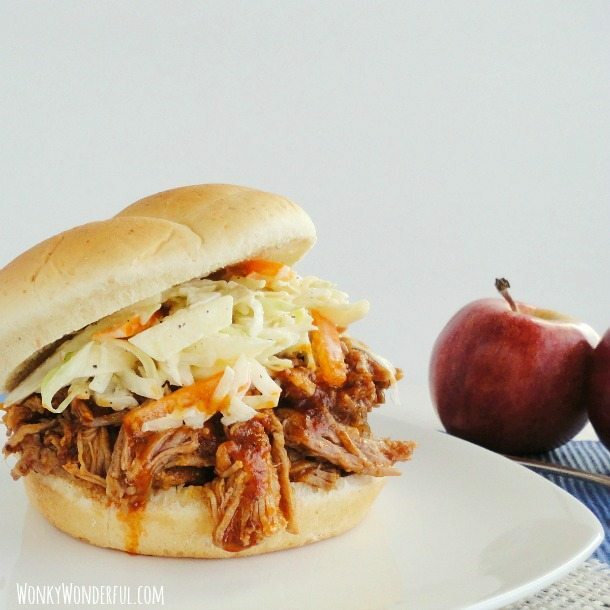 I’m calling it my Apple A Day Pulled Pork Sandwich! Don’t forget about the Slaw! Check out my Creamy Apple Cabbage Coleslaw recipe for the perfect addition to your pulled pork sandwich! *Fresh Pressed or Not From Concentrate Apple Juice can be found in the refrigerated juice grocery section. I use Trader Joe's brand or Simply Apple brand. 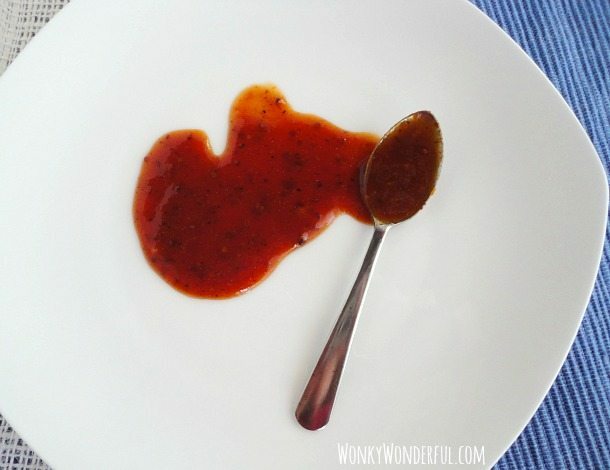 Here is a look at the gorgeous Barbeque Sauce that will be drenching your tender pulled pork. Another reminder to check out my Creamy Apple Cabbage Coleslaw . . . Click Here for the recipe. Also, I have another recipe for the leftover pulled pork (if there is any). If you followed me on Instagram you would already know what it is! I post photos of all my delicious creations on Instagram. Some make it on the blog and some don’t. Yummy, this is on our to make list this week. One question, what size slow cooker are you using for this recipe? Hi Rebecca! I use a 6 quart slow cooker. Thanks for asking, I should list that in my slow cooker recipes from now on. Have a great week! Just tried this recipe and EVERYONE loved it! I have a large crock pot, so i doubled the cooking liquid recipe so that the liquid would come half-way up the pork. I cannot wait to make this again. My son loved it so much he checked-out your blog for other recipes and promptly made the Nutella dip. Looking forward to more great recipes from you. I’m so happy to hear this recipe was a hit! Thanks for stopping by to let me know. I made this for my family and they loved it! The meat had so much flavor that we didn’t even use sauce. Thank you, thank you!